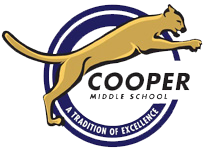 Information about students who are new to Cooper MS AND to new to FCPS. Resources and information for students. A list of digital resources for parents. Information on the Cooper Parent Teacher Organization (PTO) board members and a link to the PTO website. Our school psychologist is Evan Brooks. He can be reached at ebrooks@fcps.edu. Our school social worker is Olivia Sheng. She can be reached at ofsheng@fcps.edu or 703-442-5813.